The Cobra Sport exhausts for the MX-5 have been developed in a variety of configurations for those looking to upgrade the aesthetics of the Mazda MX-5. These options include a direct replacement exhaust with single tailpipe to one side along with dual and centre exit exhaust conversions. The new dual and centre exit exhaust systems have been designed to be fitted in conjunction with an aftermarket lower rear panel creating a re-designed sportier look to the rear of the car. All of the Cobra Sport exhausts have been developed using 2.5″ (63.5mm) mandrel bent T304 stainless steel pipework, advanced manufacturing techniques and superior TIG welding procedures produce a superlative finish. 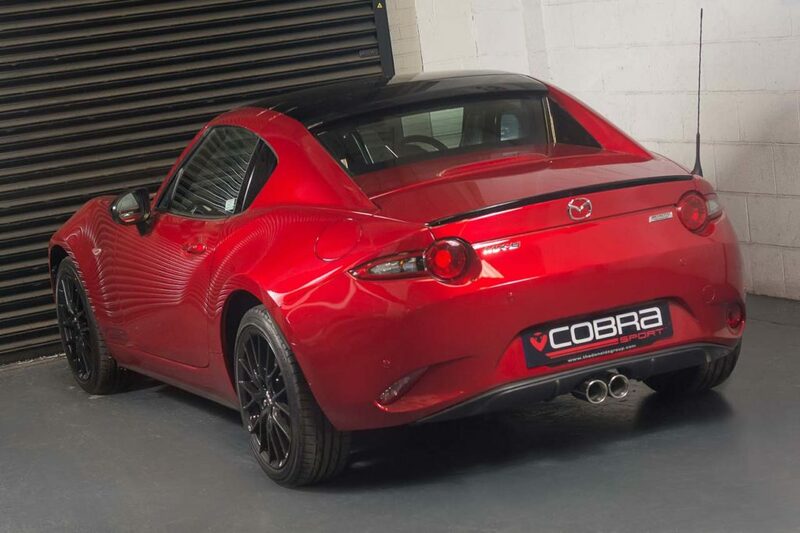 Cobra Sport Sales Manager Matt Thomas commented “We’re very excited about the release of our new exhaust range for the latest Mazda MX-5 having had extensive success with the previous MX-5 models. The unique ability to easily improve the looks and sound of the MX-5 with our Centre and Dual Exit exhaust has generated considerable interest from our worldwide tuning partners. As with all Cobra Sport exhausts, the new systems have been designed to improve the sound with increased volume whilst still having a perfectly balanced pitch and tone”.